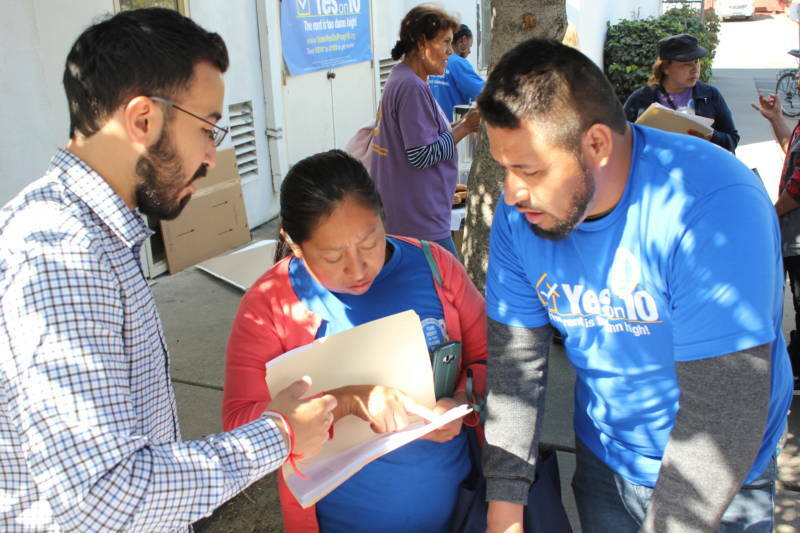 Tenant advocates held rallies across the state on Saturday in support of Proposition 10, a statewide ballot initiative that could pave the way for the expansion of rent control. At an event in Oakland, Sabirah Mustafa wanted to get some tips from an organizer to take the campaign door to door, though it soon became clear she had concerns of her own to share. Mustafa said she struggles to manage rent increases in the Section 8 home she rents with her mother. ""She's elderly and there's no protections. So it's real important that we ..."
"Change this," another volunteer said, as Mustafa trailed off in tears. Alliance of Californians for Community Empowerment (ACCE) action organizer Anya Svanoe runs through the Proposition 10 door canvassing script with Sabirah Mustafa, who says she struggles to manage rent increases in the Section 8 home she rents with her mother, not far from her childhood home in Oakland. She says of Proposition 10, "We need this. I'm tired of fighting." Vanessa Riles had an eerily similar story. She rents a place with her mom across the street from the home they used to own. The rental is a single-family home, the kind of property exempt from the state's 1995 rent control restrictions, known as the Costa-Hawkins Rental Housing Act. "When I look around my neighborhood, and the kids I used to play with and the people that I knew, they're gone," Riles said of her once African-American community. "There's only one other family that's still in my neighborhood that was there when I was a kid. " Gentrification is one reason that proponents of Proposition 10 want to give cities across California local control when it comes to rent hikes. 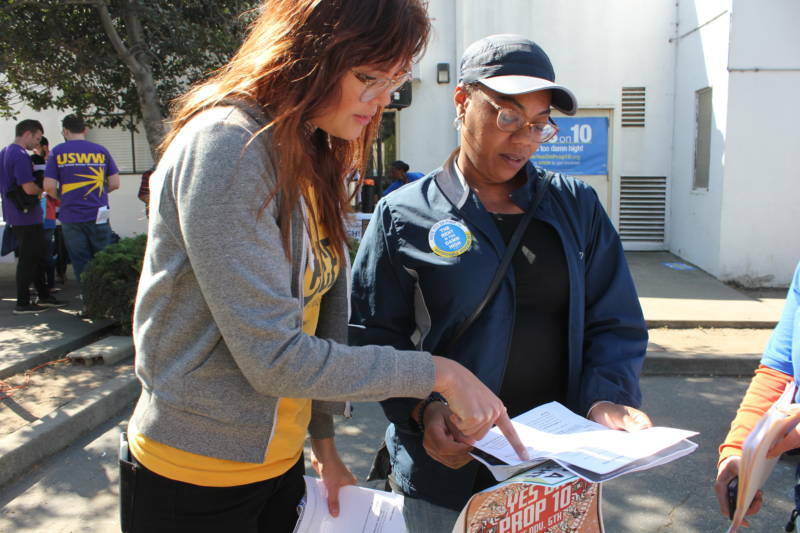 Eduardo Colon gets neighborhood canvassers ready to set off during a Proposition 10 rally in Oakland. Many landlords, homeowners and developers oppose the proposition. But Jess Ausinheiler says she believes that it's possible to strike the right balance — making extra money from a shared unit in her home at a price that's still fair for, say, a teacher. "I think it's kind of like a community agreeing on a shared value system," Ausinheiler said. 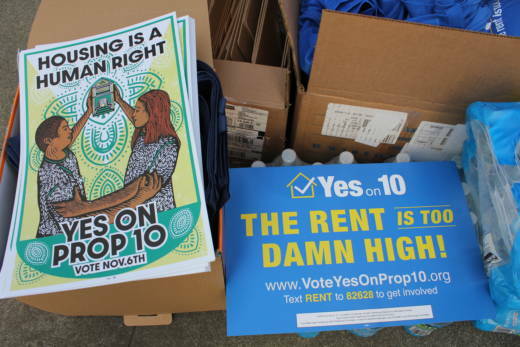 Proposition 10 supporters say the housing crisis is not just a Bay Area phenomenon, and pressures on renters are increasingly being felt around the state. Rallies were held throughout the Bay Area — in Richmond, San Francisco, San Jose and Sacramento — while statewide rallies included Orange County and Los Angeles. While Proposition 10 will come down to the voters in November, no one is sure what cities will do with their newfound power to regulate rents, if they get it.